The contemporary 0.65 Carat t.w. Stud earrings feature 4 brilliant Princess cut Diamonds showcased within a double beaded raised Bezel creating a stylish square center design. Highly polished white gold double beaded milgrain curved edges form arches which masterfully complement the outer row of channel baguettes. 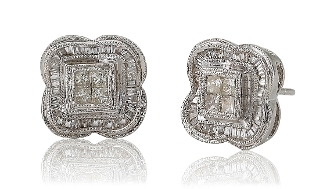 These dazzling earrings shimmer in trendsetting style and are secured by stabilizer push backs.